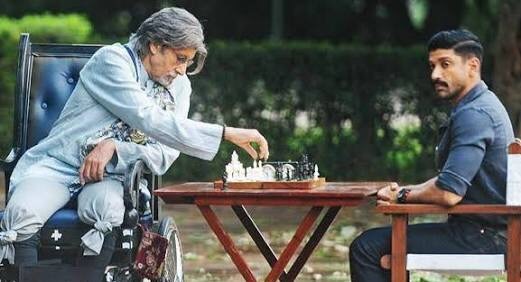 Wazir- A brave ATS officer (Farhan Akhtar) and a disabled grandmaster (Amitabh Bachchan) face a mysterious and dangerous opponent (Neil Nitin Mukesh). The film Opens with Danish (Farhan Akthar)and Ruhi (Aditi Rao hydari) driving to the market in Delhi with their only child busy playing on the phone ,when Danish spots a car with a terror group and calls his co-team member and follows the terrorist while chasing the car and once they reach in site and start firing each other,Danish (Farhan Akthar ) realises his child is quite and bleeding,but as they reach the hospital she is declared dead Now the movie actually begins.The story begins moving in the first 15 minutes itself,and using the incident described earlier as a prologue for the story.Amitab Bachan the protagonist of the story is introduced just when you think about where is the game of chess coming? The Movie about just 103 minutes (1Hr43Min)moves fast enough for you to wonder what will happen next ? a thriller based on an Original Story by Vidhu Vinod Chopra,also the Producer of the movie gave an opportunity to Bejoy Nambiar the Director,who many thought debuted with Wazir,but in fact has made two movies earlier (Shaitan 2011) With kalki koechlin ,Rajit kapur and RajumarRao and (David 2013) both the movies which don’t really ring a bell in your mind .But Wazir making it difficult to predict the end was a thrilling movie ,based on a story of game of chess. The background score builds the tension when needed in the movie ,most noticeable during the moments of argument between Neil Nitin Mukesh and Farhan Akthar and the moment when Farhan Akthar is chasing Amitab Bachan and trying to stop him going to the airport . A lot of the movies these days are working on the background music and mostly working on a track that might become more popluar then the rest and “Atrangi Yaari” is one such song .This movie had to release 6 months ago ,but finally released in January this year and it was worth the wait .Wazir – Go ahead and watch this one. Storytelling Vs telling a lie.